Our home is a family friendly, relaxing get-a-way for ourselves and our friends. 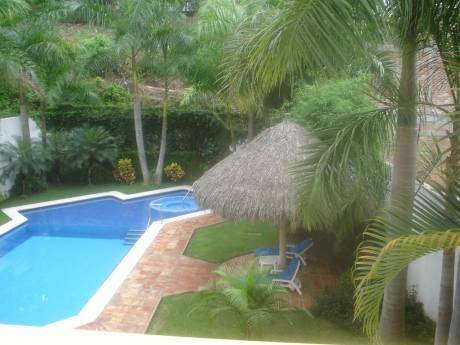 The condo has 2 large terraces and a jaw-dropping view of Banderas Bay and the city. The condo has a master bedroom with king bed and private bath. One guest room has 2 twins which can be pushed together to make a king and also has a private bath. Both of these rooms have balconies for sunning or relaxing. Another guest room has 2 over sized chairs which fold down to make very comfortable x-long twin beds. A full bath is beside this guest bed room. As I love to cook, the kitchen is fully equipped and is open to the living and dining area. We have a maid, Cruz, who comes 3 times a week and after 10 years is really in charge of the place. She is priceless! 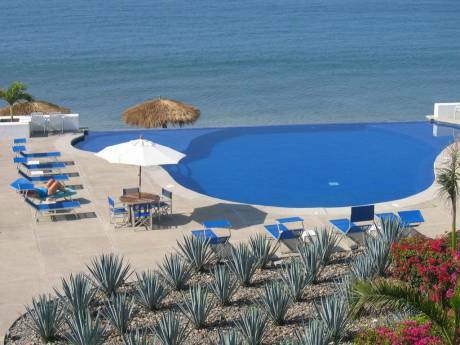 A huge pool, inclosed sand areas, and tropical garden lead to a private gate which opens onto the Malecon. This is a wonderful oceanside walkway which runs about a mile and is enjoyed by tourists and Mexicans alike. We have a great friend from England who will pick you up at the airport, bring you to our condo and be available for any questions or information. It is important to us that you enjoy Mexico and our home as much as we do. A word about security, the issues you read about are confined to the border towns, Puerto Vallarta is safe, safe, safe. Please google, crime in puerto vallarta, for follow-up. Mexico and its&acute;people have so much to offer and the prices are more than reasonable. My husband and I spend the winters in Puerto Vallarta, Mexico and the summers in Denver, Colorado, USA. We have always enjoyed experiencing other cultures and nearing retirement decided it was our opportunity to spend more time in the more laid back, family oriented Mexican culture. Our granddaughters have Mexican friends and are learning to speak Spanish and to appreciate another culture. As very active seniors who have always indulged our wanderlust, we are looking forward to exploring our own and other countries. 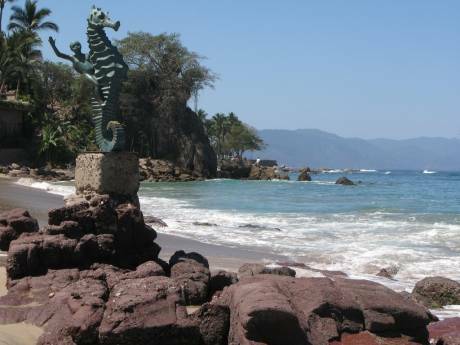 Our condo is located in what is called the romantic zone on the southside of Puerto Vallarta. We are directly on the Malecon which is an oceanside walkway running along beach and town. Although we have a car here, we rarely drive it as restaurants, activities,tours and shops are all within walking distance. Taxis are easily obtained and very reasonable. The public bus system is always running to the Marina, etc.